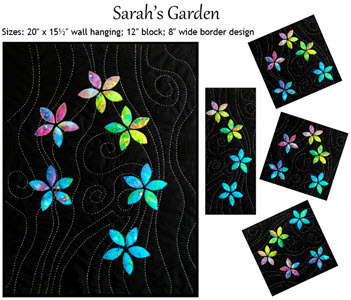 A New Art Quilt Design with Sashiko » What's Under the Needle? To start out, I cut out a rectangle of black fabric for my background and drew some curvy lines where I want the Sashiko to go. 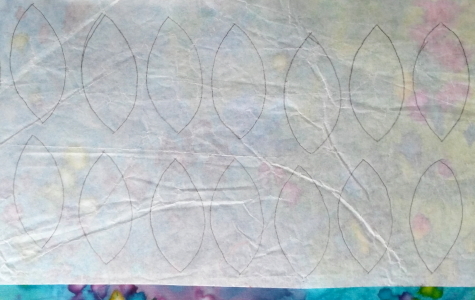 Then I drew some petals on fusible webbing and pressed that to the back of my colorful fabric. One of the things I love about this fabric is how it changes colors so I knew my flowers would change too. 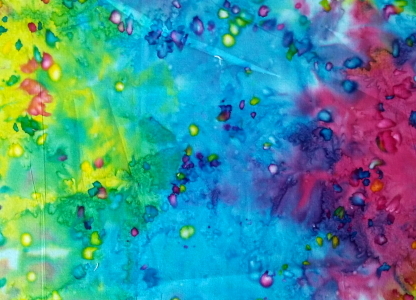 It was fun watching the color emerge as I cut each out and placed it in a flower design at random - 5 petals per flower. I kept placing the petals in order as I cut them so you can see how the colors change around from one flower to the next. 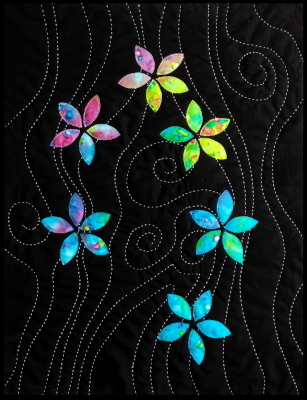 I Sashiko embroidered the background first, then I used soft-edge applique stitch around the petals. It doesn't matter which way around you do it because both were stitched through layers. If I had hand appliqued the flowers, then that would have been done first without the layers. For the Sashiko, wherever I could, I started at the edge of the design. When I couldn't, I held the fabric tight so those first few stitches that didn't form well became my locking stitches. When I needed to end within the design, I cut the threads longer and pulled them through to the back to be knotted off. My piece is finished and I've called it "Sarah's Garden". This is such a pretty design! I love the colors of the fabric used for the petals.